Gooey Marshmallow Monstrosity Brownie Cups had a very interesting beginning. I have been busy in the kitchen experimenting with a few new recipes. This is always one of my favorite things to do; even when I am not sure if a dessert will work. Case in point, I bought a bag of gigantic marshmallows. I am not talking about oversized marshmallows. Noooo, each of these marshmallows could be a meal unto itself. After eating enough gigantic marshmallows to actually begin feeling a tad ill, I realized I needed to do something else with them. I love the combination of marshmallows, chocolate and peanut butter, so I my mind began to focus in that general direction. I decided to start with my Gooey Brownie Cups recipe and improvise from there. I put just under half of a scoop of batter into a muffin cup and placed a round peanut butter creme cookie in the cup. The marshmallows are so obscenely big that they had to be cut in half, lest they end up above the pan. After cutting them I placed one marshmallow half over the cookie and topped it with the remaining half of the batter in the scoop. I learned two very important lessons when I baked this dessert. First, place a piece of aluminum foil under the pan to catch the marshmallows that explode out of their respective cups. Second, sometimes delicious desserts do not look very pretty! I was telling a friend about my disaster and that I was not sure whether I could blog about it. He very wisely said that sometimes it is good for readers to see that disasters happen in everyone’s kitchen. Sounded good, but what about the taste of this monstrosity? I mean, the marshmallows basically become some kind of toffee like, crunchy mess on the pan and around the top of the cup. I decided I could not be objective enough so I shared them with fellow foodies. One friends words are not really blog appropriate, so let’s suffice to say he was VERY happy. My other friend, who knows more about desserts than anyone else I know said it was, “Over the top”. That was when I knew this worked! 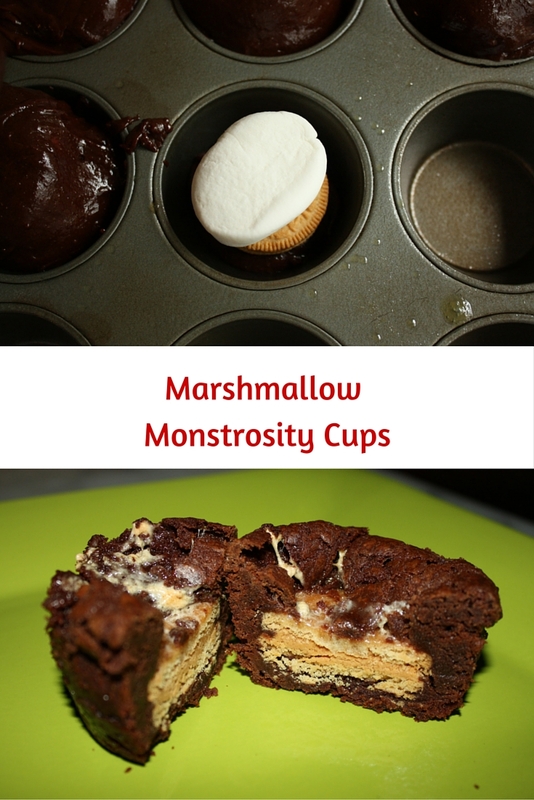 All that was left was finding the perfect name, which I finally did…Gooey Marshmallow Monstrosity Brownie Cups. I guarantee you will have a good laugh when you see it come out of the oven to be followed with a big smile when you give it a try. Place a piece of aluminum foil on middle rack of oven. Preheat oven to 350°. Set aside a 12-cup muffin pan. Place the butter, brown sugar and sugar into a large microwaveable bowl. Microwave until the mixture is completely melted and bubbly. Be sure to use oven mitts when removing from the microwave as the bowl will be very hot. Whisk to blend the ingredients together. Whisk in vanilla, then the flour and salt. Continuously whisk the mixture while adding the eggs, to prevent cooking the eggs. Lastly, use a wooden spoon to mix in the chocolate chips. Most will melt, but you will have some that still hold their shape. Spray the pan with non-stick cooking spray. Use a large cookie dough scoop to transfer batter to pans. For each cup, scoop just under half the scoop of batter and place a peanut butter creme cookie over this. Place marshmallow half on top of cookie. Top it with the remaining half of batter in the scoop. This will drip down sides of each marshmallow as well, covering them completely. Bake at 350°, on aluminum foil, for 18 minutes. The marshmallows will look like they exploded, which is pretty accurate. Remove and cool completely in the pan. Use a small metal spatula to go around the edges of the Marshmallow Monstrosity Cups and lift out of pan. Some will lift out very easily and some will have to be helped out of the pan. Can you substitute anything else for the peanut butter cookie? Peanut allergies here. Thanks! Absolutely! Substitute either a vanilla or chocolate cookie creme cookie for the peanut butter. I don’t think they look like a monstrosity. I think they look positively yummy. Can’t wait to try. The monstrosity name is purely due to the explosion I had in my oven. They not only look yummy, but taste it as well! I can’t help but love anything with “monstrosity’ in the name. These look so fun, Besty! 5 stars and no one actually made them? Thanks for asking! 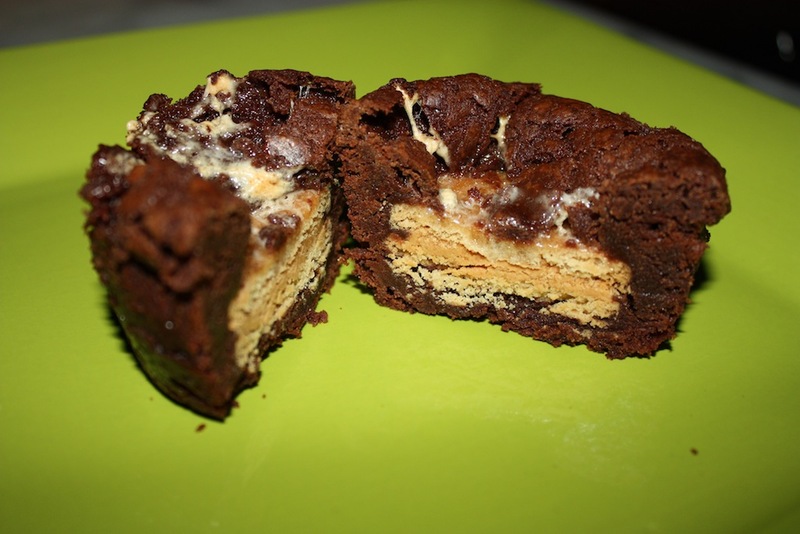 S. Klein wrote the comment and then came back and rated Gooey Marshmallow Monstrosity Brownie Cups after she made the recipe, which is why she rated them.